Travel Magazine: Features three articles about Hetta Huskies arguing that age should never limit adventure - particularly when mushing holds the keys to the vast wilderness for those who can no longer get their under just their own steam. Trip Adviser Profiles Hetta Huskies Farm: Gives us the highest possible rating. National Geographic Poland: An article written by National Geographic Poland which presents 5 reasons to go to Finland…..including Hetta Huskies! CondeNast Traveler: talk about our kennel as one of the great experiences to be had in Enontekiö and explains that it makes you feel like you are in a novel by Jack London for a while. Up Worthy: This is an article based around the Knorr flavour of home commercial shot at our farm in 2013 and released in 2014. The Working Traveller: This site profiles a select four out of the many kennels offering trainee husky guide positions (effectively) and includes Hetta Huskies in the mix. 'Hecktic Travels' (National Geographic Traveller's of the year): Blogged about their time in Hetta Huskies. 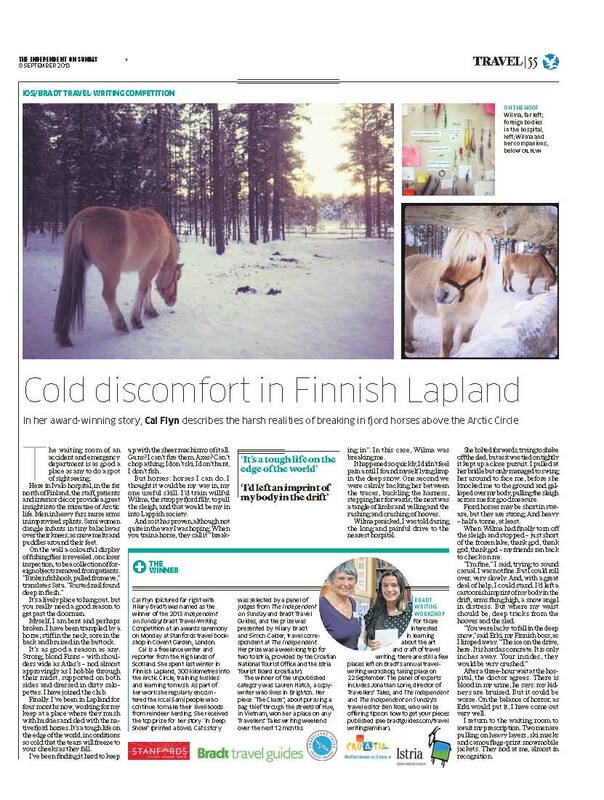 Cal Flyn blogs about her successful Hetta Huskies Telegraph article.. And also shares an award-winning article about the rest of her time (ie post Hetta Huskies) in Finland, wrangling other Arctic Animals. The Frei Clients have now taken part in two multiday safaris with us and have also been back to visit in the summer. They sponsor two of our dogs and have adtoped another so they are starting to feel like part of the family! The Frei Clients round 2. Siroccoverland: 2 clients on an around the world journey blog about their stop at Hetta Huskies. Mookychick article written by a former trainee guide. The Coldest Journey: Ran Fiennes' latest trip gives us a sponsorship thankyou in return for some help and equipment advice. Wikitravel: Says that we are one of the two key attractions in the whole region. Wikivoyage: Wikitravel's comments about the value of visiting Hetta Huskies when travelling through Enontekiö are repeated here. World Travel Market London: c. 200 companies from over 69 countries selected as part of the World Responsible Tourism Awards 'Longlist' for 2015. TTG Nordic: This article outlines the 5 Nordic companies who made the initial WRTA long list in 2015. TTG Nordic: This article outlines the 4 Nordic companies who made the final WRTA short list in 2015. Travindy.comThis press release came out when the finalists of the 2015 awards were announced - 37 organisations from 20 countries including, for the first time, a Finnish company. Winston Churchill Memorial Trust AwardAnna was awarded a prestigious Winston Churchill Memorial Trust Award for her leadership of an innovative and inclusive crossing of the Greenland Icecap in 2006. The expedition website can be found here and their expedition report will shortly be available to download from the winston churchill memorial website.